Homeowners go through great lengths to make sure that their walls, roof systems, windows and doors all have the highest level of insulation. And for many good reasons: it saves on money and fuel. But many ignore a significant source of heat loss in the average home—the foundation. Amazingly, 10 inches of concrete only has an R-value of about 1. But many contractors either leave it up to the homeowner to insulate from the inside with floor joist insulation and styrofoam and waterproofing on interior surfaces. But most experts agree that taking care to insulate and waterproof the exterior of the foundation—slab, crawlspace or basement—can pre-empt many possible issues, including dampness, mold, and heat loss that can account for as much as 50 percent of your home heating bill, depending on your location. Less insulation required than if the basement ceiling is insulated. With today’s large footprint homes this can be significant. For example a 36’x48’x 8′ basement requires 1,350 sq. ft of insulation; the same basement requires 1,725 sq. ft. of basement ceiling insulation. Reduced thermal breaks for wiring, plumbing and ductwork. Lower HVAC cost and energy loss because with an insulated foundation the pipes and ducts are in conditioned space, and don’t require freeze protection. Radon in the surrounding soils may require a radon mitigation system to prevent build-up inside insulated walls. Termites can use the foam insulation as a pathway from the ground to the home. If termites are a concern in your area, ask your builder about EPS foam that contains anti-termite borates, such as R-Control’s Perform-Guard, in addition to treating the ground around your home. Installed flashing between the foundation and the wall systems should also limit termite access. One of the fastest growing solutions for foundation insulation are insulated concrete forms. They offer a simple way to improve foundation energy efficiency. They provide a neat transition between below grade and above grade foundations. 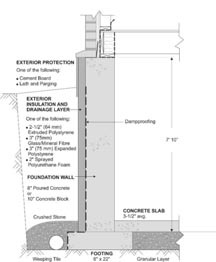 For more information on insulating concrete forms, click here.